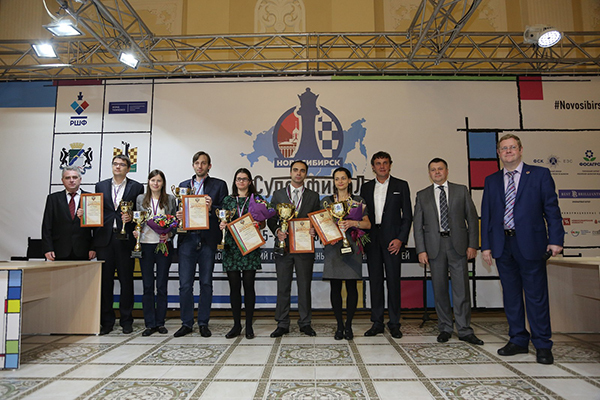 The Russian men's and women's chess Superfinals took place in Novosibirsk from October 15 to 28.The event was finely organized and took place in a museum. 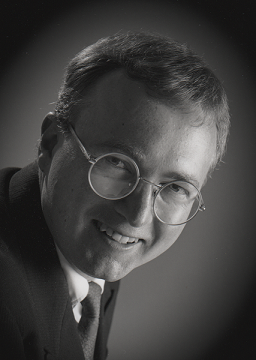 The format was a 12-person round robin. Apart from the financial prizes for all the participants (9 mln rubles total prize pool) a Renault Kuptur car and a gold statue incrusted with diamonds (king for men, queen for women) were at stake in both tournaments for 1st place, resulting in an intense and exciting battle. Natalia Pogonina finished 2nd in the women's event. Her previously earned medals were: gold (2012), silver (2010), bronze (2013). 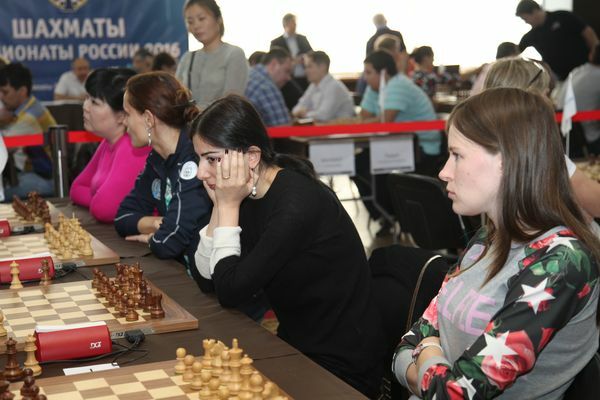 The Russian rapid & blitz chess championships among women, men and seniors took place in Sochi from October 1 to 7. We will focus on the results of Natalia Pogonina and her team Ugra (Natalia Pogonina, Lilit Mkrtchian, Marina Nechaeva, Baira Kovanova). 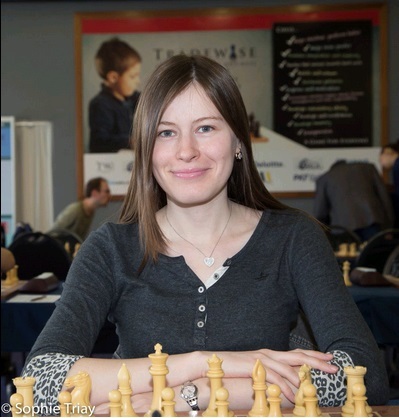 Don't miss your chance to play WGM Natalia Pogonina on May 21st during the May chess blitz marathon from 7 to 8 pm UTC. With a bit of luck you can also challenge her to a Chess Heroz match at any other time. Just log in to the application and send her a game request. 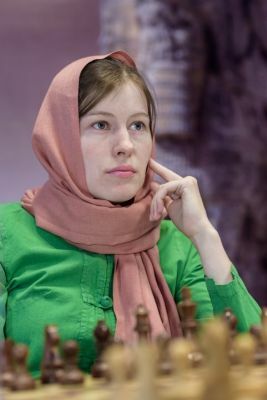 Don't miss your chance to play WGM Natalia Pogonina on April 23rd during a special Sakura chess blitz marathon from 7 to 8 pm UTC. With a bit of luck you can also challenge her to a Chess Heroz game at any other time. Just log in to the application and send her a challenge. 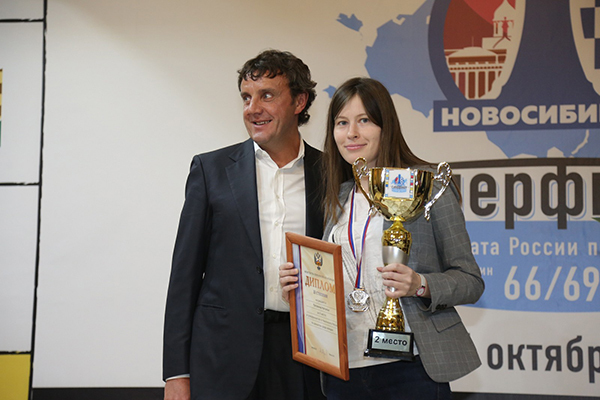 From February 10 to 24 Natalia competed in a stage of FIDE Women Grand Prix in Teheran. After a spectacular start she was co-leading the event with 5.5/7 and had to score only half a point in the following two rounds to earn her final GM norm. Unfortunately, she lost three games in a row and bounced back with a win only in the final round. 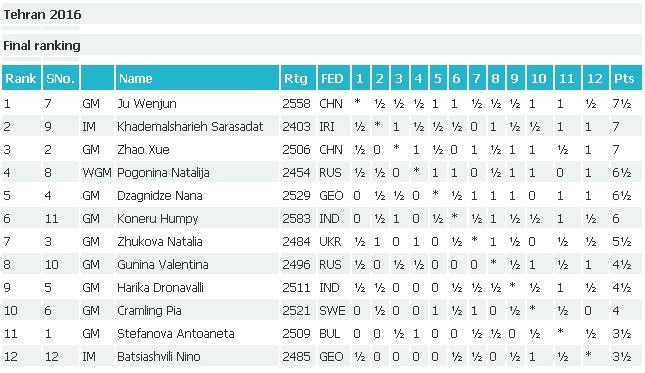 Natalia Pogonina is currently ranked #2 on the cumulative FIDE Women's Grand Prix 2015-2016 Standings. Please check out the official site for additional information and pictures. · How many games to play per year? 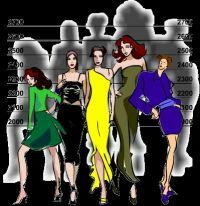 · Are women underrated or overrated as compared to men? 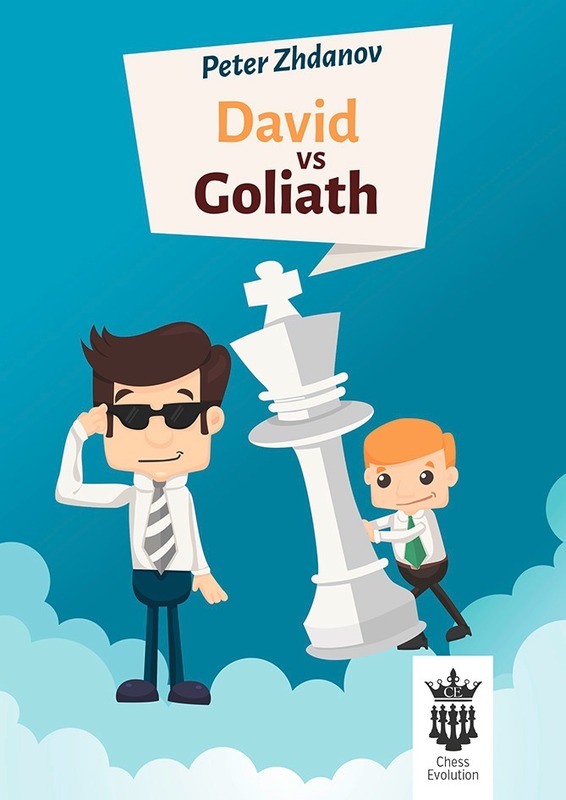 · What does your chess tell about your personality? · How does one prepare for an upcoming tournament? · Is 1.e4 really “best by test”? 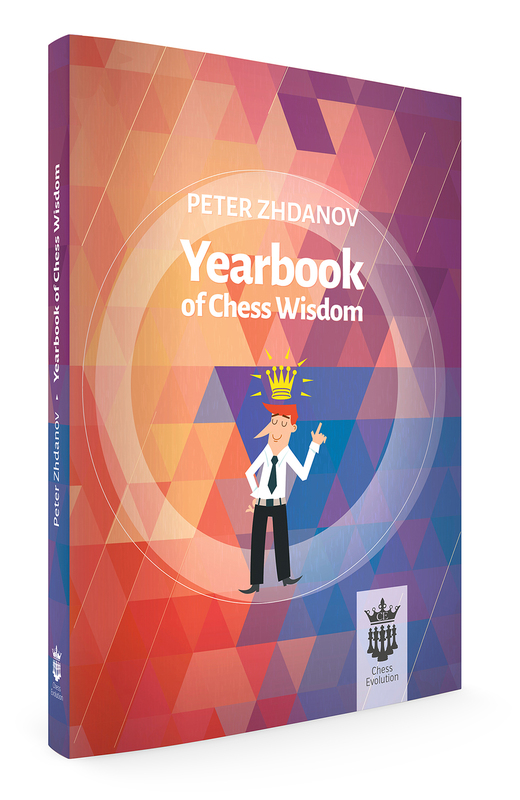 “Yearbook of Chess Wisdom” is packed with insights and is based on analytical research, vast personal experience and conversations with some of the world’s leading chess players and coaches. 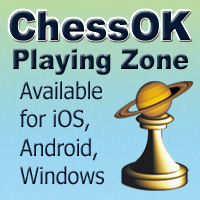 Don't miss your chance to play WGM Natalia Pogonina on December 19th during a special Christmas chess blitz marathon. In the 2015 FIDE World Chess Blitz Championship 21 rounds Swiss system had to be played. The players got 3 minutes for the whole game plus an increment of 2 seconds per move. The reigning blitz champion Magnus Carlsen began well, but losses against Karjakin, Radjabov, Grischuk and Ivanchuk made it impossible for him to defend his title. After 20 rounds Vladimir Kramnik and Alexander Grischuk lead with 14,5 points ahead of Maxime Vachier Lagrave and Vassily Ivanchuk (14 points each). By defeating Boris Gelfand with the Black pieces Alexander Grischuk won his 3rd Blitz title. Maxime Vachier-Lagrave won against Rustam Kasimdzhanov and became 2nd while Vladimir Kramnik had difficulties against Vassily Ivanchuk, but cleverly saved a difficult endgame with two Knights on both sides and a Pawn down. This draw meant the Bronze medal for him. 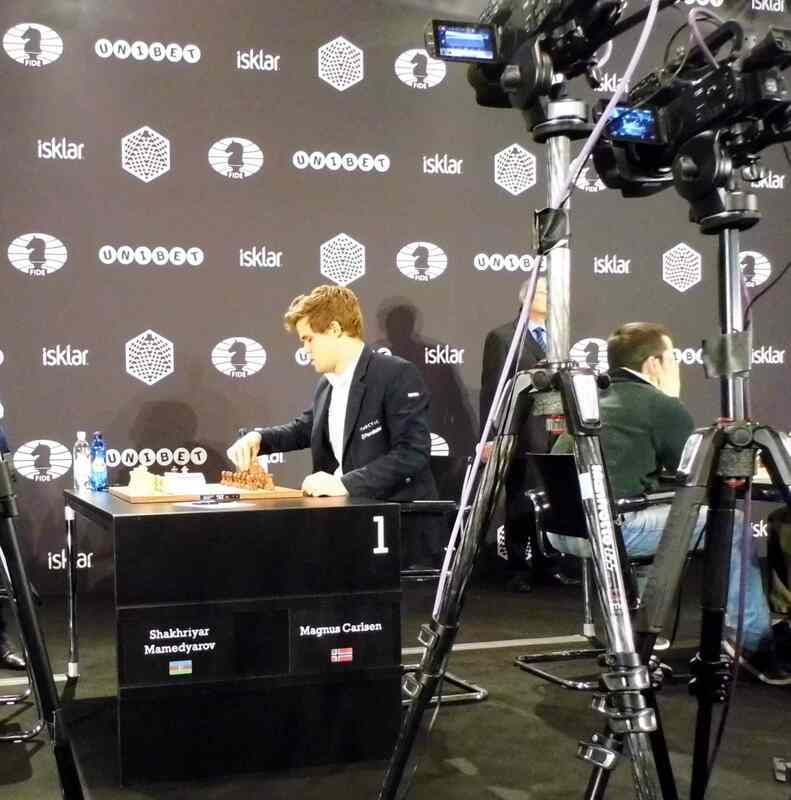 In the press conference he said that 15 or 20 years ago he had been a really good blitz player, but he had not expected such a good result today. FIDE president Kirsan Ilyumchinov announced that Berlin will host either a World Chess Championship or a Chess Olympiad, but could not yet give any date or details. On Saturday, October, 10th, the 2015 FIDE World Chess Rapid and Blitz Championship began in Berlin. The playing hall „Bolle Meierei“ is situated next to the German department of the interior and the river Spree. Participants from all over the world took part in this prestigious event. In the rapid tournament 15 rounds Swiss system had to be played on three consecutive days. The players got 15 minutes for the whole game plus an increment of 10 seconds per move. On Saturday the first five rounds were played. Sergey Karjakin who had won the World Cup just one week before presented himself in top form. He won his first three games against Jure Borisek, Grzegorz Gajewski and Anton Korobov. Only Yuriy Kryvoruchko managed to reach a draw against him. In the fifth round Karjakin defeated the German grandmaster Georg Meier and took the sole lead with 4,5 out of 5 ahead of 16 players with 4 points each, amongst them Magnus Carlsen and Ian Nepomniachtchi. Carlsen had won three of his five games. Ehsam Ghaem Maghami, a grandmaster from Iran, surprisingly drew against Carlsen in round 1, and so did Yuriy Kryvoruchko in round 5. At the end of the day 16 players had reached 3,5 out of 5, one of them being former World Champion Vladimir Kramnik.